Been a while since I made an addition to the Pierce Project. And technically, this isn't marking a card of the list. I still stand at 4 cards needed to complete the group. 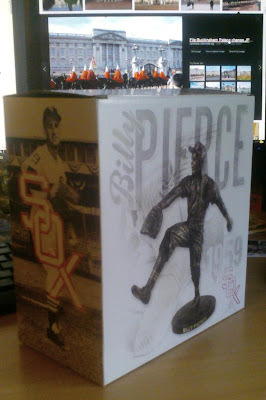 However, the team that wears uniforms that claim they are the Chicago White Sox (I'm not buying it with that record) did a Pierce giveaway a couple weeks back. I had done the Denver tour, so I did not have the money at the time to get a ticket and snag my own, but eBay came through for me. 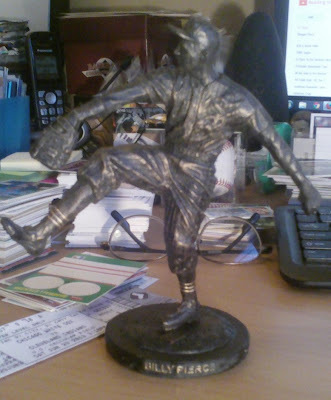 Billy has one of the statues within the Cell, and resin copies were given away to fans. It was a given one of these would end up in my possession. This puppy is heavy. And the cruddy picture does no justice to the pitcher. The seller even included the ticket stub - nice touch when I didn't even expect it. Very cool statue. Is that pewter?